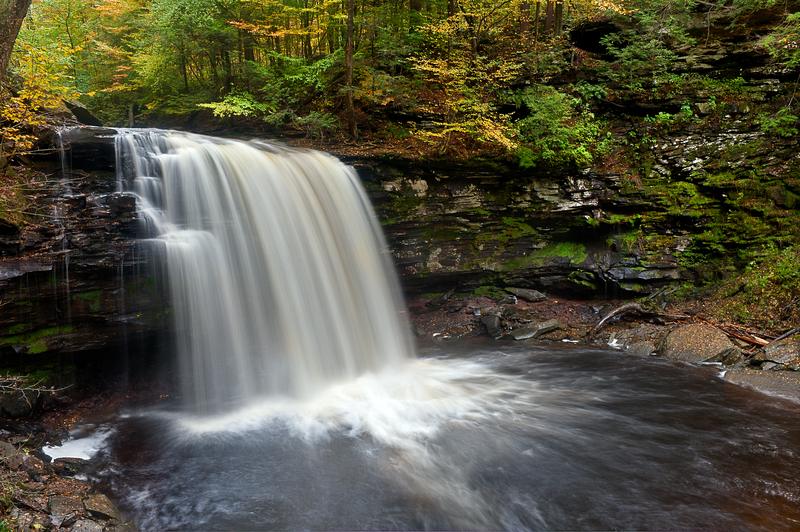 During the week, I posted an article with the first images that I reviewed and processed from my trip last weekend to Ricketts Glen State Park in Pennsylvania. 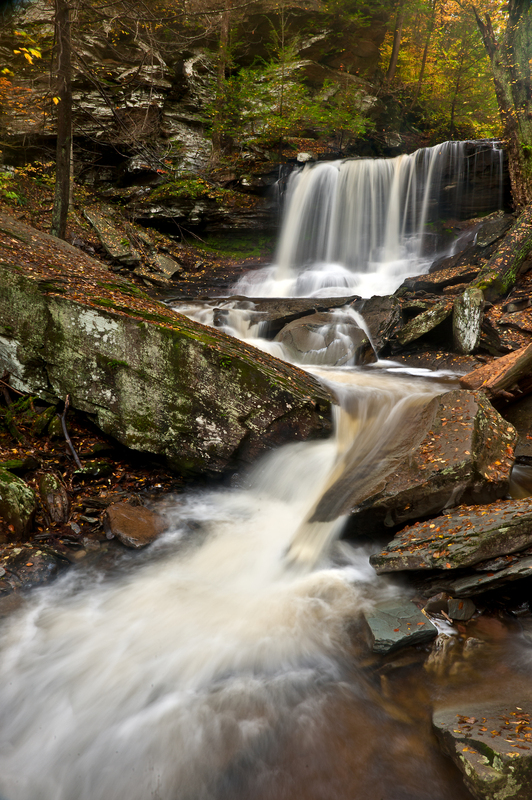 The purpose of the trip was to photograph the park’s 22 waterfalls, framed by colorful autumn leaves of surrounding trees. I now have processed many more of the images, but I am not done. 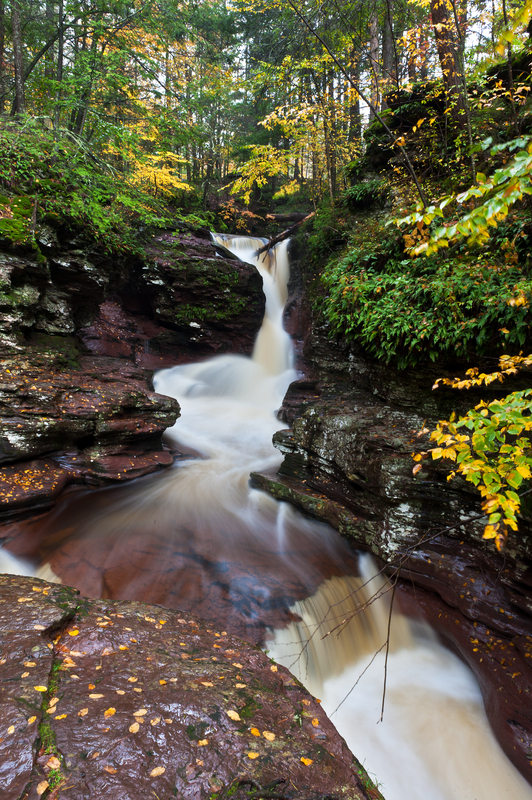 This article contains some Ricketts Glenn images of other waterfalls and the rivers leading to and from them. I also embedded another video that was recorded with my iPhone. The video, besides providing a movie of one of the falls, provides the sound of a waterfall. 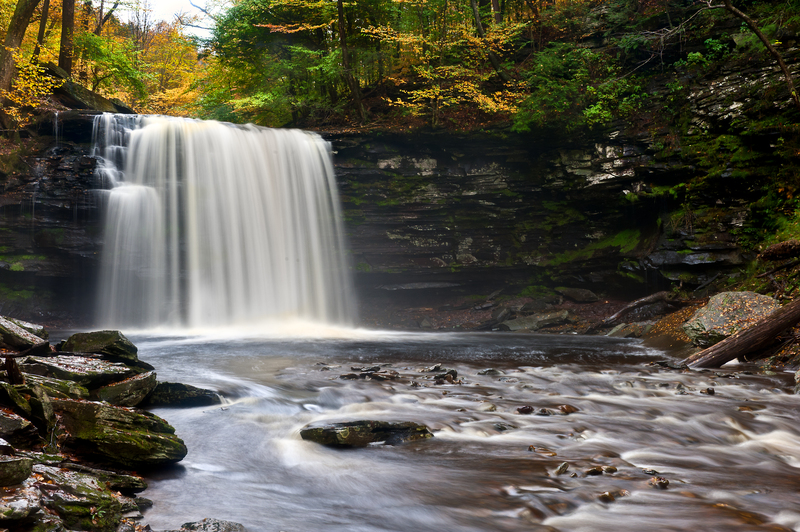 Looking at the waterfall images without such sound minimizes their beauty and attraction. Click on the below image/video and turn up your sound. As you can see from the photos, the autumn colors were at their peak. Someone that has been following my blog since I started it, about six months ago, asked me this week about my image “processing,” that I refer to often on this blog. He thought I took the photos and directly uploaded them to my blog or Website. After explaining the process to him, I thought other readers might also be interested in knowing how I process my images. As I explained to him, processing begins while taking the photographs. After deciding on a scene to photograph, I compose it in the frame, but before shooting it, I consider other key things that impact the image captured on the camera’s sensor, such as lens aperture or f/stop – which also affects depth of field, shutter speed, and the range of light and dark areas in the scene. If there is high contrast in light and dark areas, I often shoot multiple images at different exposures (“bracketing”). I bracket images so that I can blend them together to bring out details in the darkest areas and lightest areas. Sometimes, I merge two to five images together using HDR (High Dynamic Range) software, and other times, I blend them together using layers in Adobe’s Photoshop. I consider other factors while in the field, such as ISO (sensor sensitivity to light) and white balance, and I usually use a tripod and wired shutter release. Image post processing begins back home, when I transfer the image files from memory cards to my iMac and back them up. I use Adobe’s Lightroom 3 to transfer and organize the images on my iMac. After all of the images have transferred and are backed up, processing begins with reviewing and rating the images. After reviewing and rating, I work on the highest rated images. Image processing also starts in Lightroom, where I adjust, if needed, such things as the image in the frame by cropping or straightening the horizon, white balance, overall exposure or exposure of specific areas of the image (“dodging and burning”), color vibrance and saturation, noise reduction, and a few other tweaks, as needed. Then, I transfer the image into Photoshop CS5. In Photoshop, using layers, and masking when needed, I adjust contrast using either Levels or Curves depending on the image; delete any unwanted things in the image–like dust, UFOs or sometimes even people; make additional tweaks, again if needed, using various pluggins (e.g., Nik’s Color Efex Pro); and finally, I sharpen the image–usually not globally, but selectively. All digital images need to be sharpened when shot in raw format. Basically, raw means the camera records all of the digital image information captured on the sensor without any processing by the camera. The above processing description is the short version. Hopefully, for those who were not aware of this and are still reading, you found it interesting. The amount of time I spend on each image varies, and there are short cuts that can be used at times. As Ansel Adams said, “You do not take an photo, you make a photo.” Ansel Adams used a darkroom and chemicals. Today, we use computers and software. One last waterfall image for today. 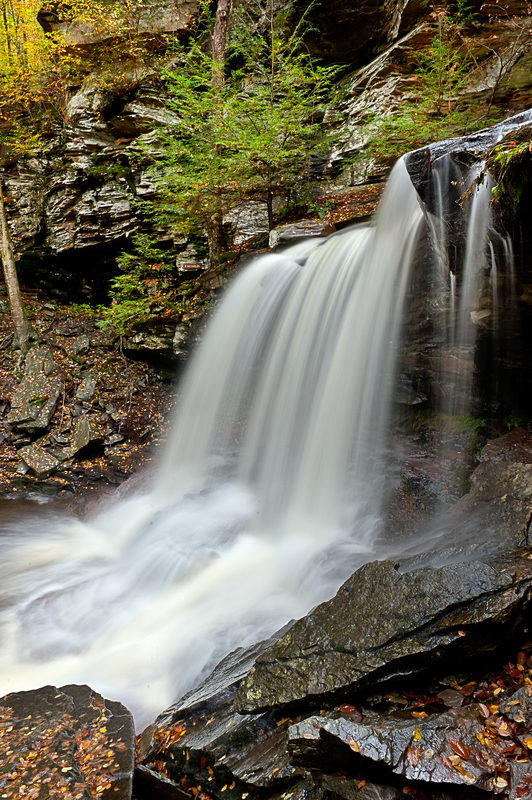 All of the waterfalls have names–the one below is Adams Falls. 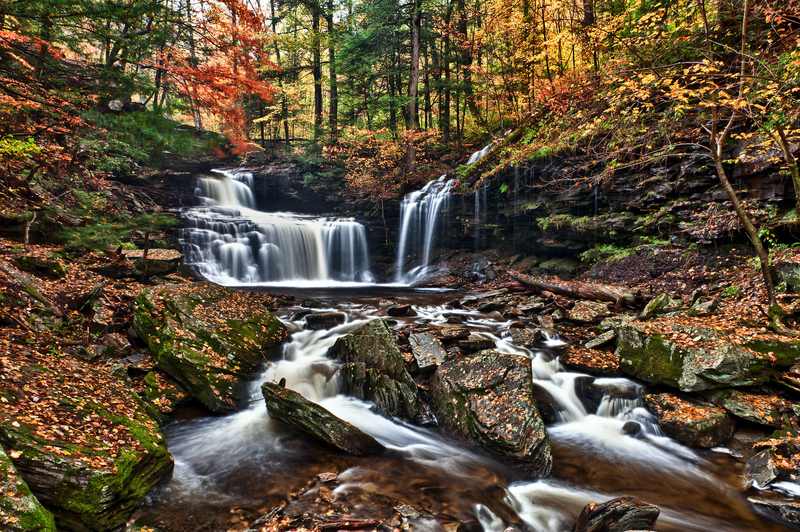 This entry was posted in Autumn Photography, Landscape Photographs and tagged Autumn Leaves, Fall Floiage, Flowing Rivers, Pennsylvania State Park, Ricketts Glen State Park, Waterfall, waterfalls. Bookmark the permalink. For a point and shoot photographer, I was fascinated by your description of image processing. If I didn’t have a deep enough appreciation for your talent already, you really had me at the “bracketing and blending” phase of the process! Now I can see how the movement of the water is captured as if on a canvas. In fact these beautiful photos remind me of paintings in an art gallery. Thanks for sharing your secrets. It’s all hard, gorgeous work!! I agree with Betty, your photos are more like paintings … and the process to produce these photos is definitely on par with creating a painting! One does not merely “dab” on paint on a canvas and one does not merely “point and shoot.” The thought process for your medium, photography, was clearly explained and I, too, have a greater appreciation of what you do to produce these incredible images. BTW love the sound of the rushing water, what a great addition to this page! You have changed how most of us presume you just take a photograph to a more understandable level when in reality you are creating photographs and are quite adept at these processes. They have a lingering effect when carefully viewed …. Very enlightening! One of the reasons I follow your blog is because you’re very candid about your process, and because you’re very talented. Thank you for sharing! Excellent work! I only wish I was shooting along side of you. I do use Twitter at #stabone. 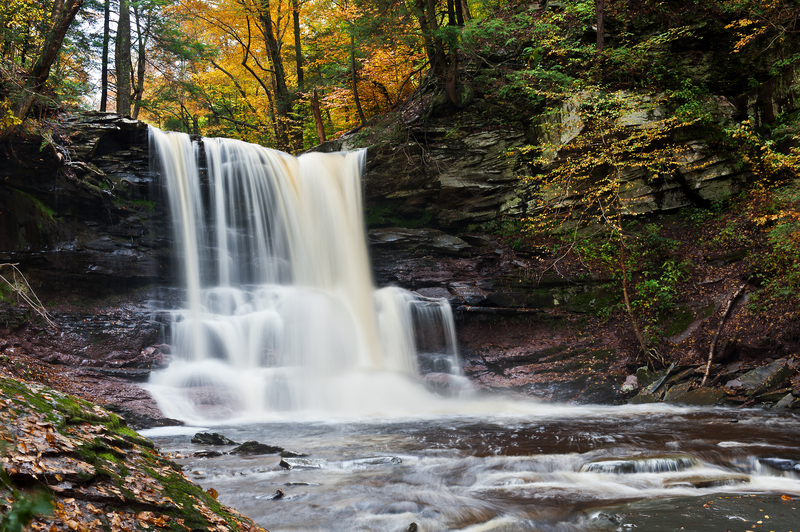 How far did you hike start to finish to capture all of these beautiful waterfalls? I did it in one day (full day). There is a round trip hike down and up. The distance is not bad. 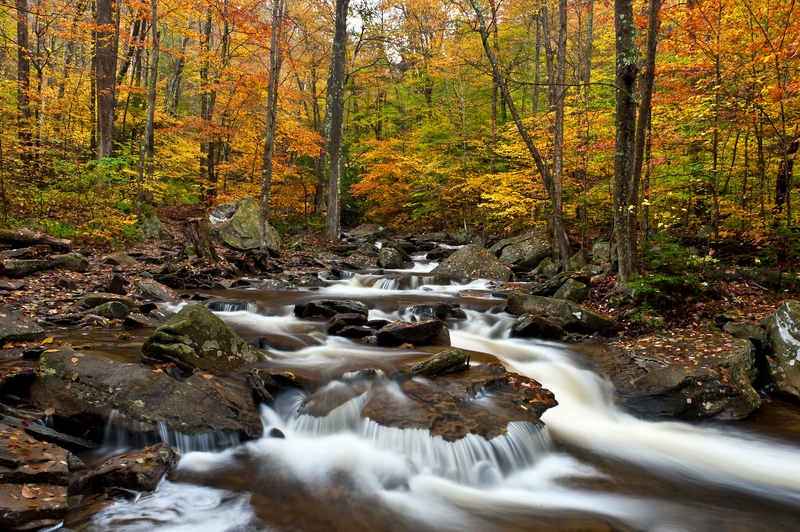 It is the challenge of climbing up and down wet rocks along the river/creek without falling that is the challenge.